When your child gets to the age of 1, they’re more curious about everything around them and they’re keen to explore every nook and cranny. They’re more alert and are attracted to toys with bright colors, flashing lights and all kinds of different activities and sounds. With that in mind, our dedicated team have researched hundreds of toys to find the best activity cube for 1 year old toddlers. Any one of the toys on our list would make a perfect birthday or Christmas gift for your special toddler. We’ve gone the extra mile to ensure that we selected only the top quality cube activity centers so you can shop with confidence. If you’re looking for a fun and engaging toy for your 1 year old toddler, then the ALEX Jr My Busy Town Wooden Activity Cube might be the perfect choice. Made from solid wood, this bright colorful 16″x12″x12″ cube has 5 sides with lots of activities for your son or daughter to enjoy. On the top side of the cube, there are colored wires with large beads for your toddler to manipulate and move. Another side has peek-a-boo doors that open and close to provide great excitement and fun! There is also a side that has spinning wooden cubes with letters of the alphabet and a corresponding image for that letter so your child can learn and grow in a fun way. The My Busy Town cube also has a side where your toddler can race cars with a sibling or friend, as well as a side where they can spin and match animals. 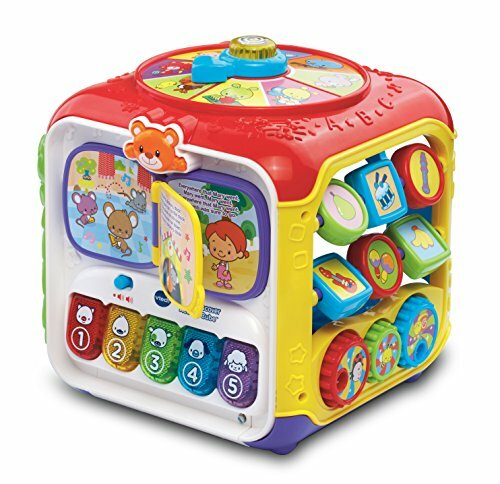 Guaranteed to keep your one year old enagaged and entertained while having great fun and learning, this Alex Jr Activity Cube is a very popular choice with parents. Parents love that it’s non-toxic and BPA Free, durable and will grow with their child, giving them great value for money. This cleverly designed wooden activity cube is both fun and educational, making it a wonderful gift idea for any 1 year old toddler. Fantastic fun and engaging toy that one year olds love! The Vtech Sort And Discover Activity Cube is a 6 sided cube with activities built into 5 sides and it’s perfect for 1 year old toddlers. It has everything your child could want; lights, sounds, bright colors, and lots of activities to keep any young child engaged and having fun. It’s available in Red or Pink which makes it ideal for both boys and girls. This Discovery Activity Cube will introduce your child to colors, numbers, animals, sounds and songs and takes 2AA batteries. There is a built in book with pages to turn and cute pictures and over 75 songs and melodies for your little one to enjoy. Also, there is a twist light up spinner, animals to slide along the track, piano keys and a shape sorter, among other activities. This activity cube will introduce your child to colors, numbers and shapes to help familiarize them with these concepts that they will need to learn later. Lots of parents shared that their one year old toddlers loved this Discovery Activity Cube and that it kept them thoroughly entertained for several hours. They also shared that it helps their young kids to prop themselves up better while sitting, and as they grow and become more active, they are able to use the cube to pull themselves up. If you’re looking for a cube with lots of exciting activities to really engage your toddler, then the Vtech Sort And Discover Activity Cube is a solid choice. 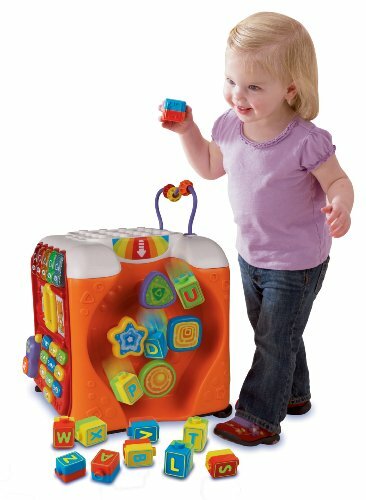 Toddlers just love this cube and all the activities, lights, colors and sounds that come with it! The Vtech Busy Learners Activity Cube is very popular with parents of 1 year old children and has received outstanding reviews. Available in Red or Purple, it is suitable for both boys and girls as it has several gender netural activities for them both to enjoy. This Vtech Activity Cube takes 2AAA batteries and has a motion sensor, so whenever the cube is moved, it automatically turns on catching your toddler’s attention with sounds and lights. There are 5 sides of fun activities for your child to engage in with buttons to push, blocks to spin, and objects for them to slide, as well as 25 songs and melodies for your little one to enjoy. The top side has 4 light up buttons for your child to press: circle, triangle, star, square. Each button has an animal picture on them with animal sounds, musical tunes, games and much more! The circle has a bird on it, the triangle has a cow, the square has a cat and the star has a dog. Your child will love hitting the buttons over and over again and will love the sound and lights. Also on top is a spinning cylinder that rattles. The second side has spinning letter blocks; A,B,C, and D and a third side has spinning shapes for your child to enjoy. There is a fourth side that has musical instruments such as drum shakers, drum, and a cymbal and the fifth side has a spinning ladybug that your toddler can flip over and over. The cube introduces animal names and sounds as well as different shapes making it a very educational toy suitable for early learning. A number of parents shared that the reason they love this Busy Learners Activity Cube is because their child enjoys it so much, they will play with it for hours, giving them a chance to catch up on other things. Wide range of activities for your one year old to enjoy and have fun with! Great learning toy as your child can learn numbers, shapesm animal names and sounds and so much more! Measuring 15.7” X14” 15.9” and made of natural wood with non-toxic paint this EverEarth Garden wooden Activity Cube features lots of activities your little one year old will love. What makes this cube unique is that there are 6 sides with activities for your child to engage with and enjoy! 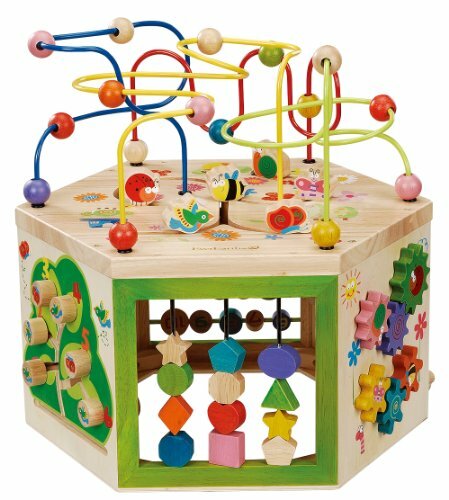 The activity cube bead maze on the top really catches children’s eye as they love the bright colors and moving the beads along the winding wires. There are lots of gears that turn, shapes to spin, as well as animals and objects that slide along a track on other sides of the cube to really keep your child interested. It also comes with detacheable shapes that fit into a geometric shape sorter type of activity. This is a great learning activity cube for kids as it introduces shapes, colors, numbers, animals and so much more. The size of this cube makes it perfect for your 1 year old to play independently or with another small child or parent. It’s the right height for them when they are sitting down, as they can reach the activities easily and engage with them. The advantage of having 6 sides is that it’s less likely to tip over if your child does try to pull themselves up using the cube. Several parents shared that they bought this cube for their child’s First Birthday as a gift and it was a huge hit! Fantastic fun as your toddler manipulates beads, shapes, gears and more! Made from natural wood which parents absolutely love! 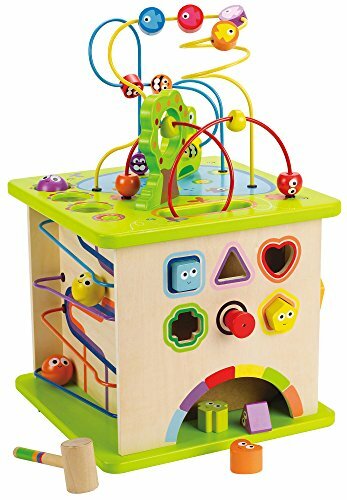 The Hape Country Critters Wooden Activity Play Cube measures 13.8” X 13.8” X 19.7″ and is extremely colorful making it very attactive for 1 year olds. Made with non-toxic paint this activity cube toy features a shape sorting puzzle, a bead maze, spinning balls, a ball with mallet, a roller coaster and tracking panel. The wooden beads in the activity maze has cute little faces of animals and fish and there is also a frog on top. One side has a geometric shape sorter with cute little faces on the shapes to really enagage your child. Another side has a rollercoaster for wooden balls with happy smiley faces to roll down. In order to make the balls roll, your one year old will need to hit each balls with the mallet which they will really enjoy! On another side, there is a large maze with more animal pieces for your child to spin. All in all, this wooden Activity Cube for 1 year olds is a wonderful educational and learning toy for your child that provides a whole lot of fun, excitement and engagement! Feedback from parents is super positive and they love that it’s made from wood with solid construction that’s built to last. If your looking for a great activity cube as a gift for your child’s birthday or Christmas, then this exciting Country Critter Cube from Hape, might be the perfect choice! Kids love the little critters with happy faces featured throughout the cube and have great fun playing with them! This Vtech Alphabet Activity Cube provides plenty of fun activities for your child. There are over 100 songs and phrases for your child to enjoy, and 13 blocks containing all 26 letters of the alphabet. There is a side in which your one year old can insert each block to learn the name of each letter and hear a song about each letter. Your child can also stack the blocks on top of the cube and create their own structures for even more fun! There’s a number pad to teach your child numbers, piano keys so your child can play songs, a play telephone, peg maze, sliders, gears and mirror. The piano keys have different shapes and colors to make learning even more enjoyable for your child. It is a wonderful electronic activity cube that has so many activies and features to captivate and hold your child’s interest for long periods of time. This Alphabet Activity Cube introduces your child to letters and numbers and can later be used for letter and number recognition. It runs on 2 AA batteries and there is an automatic shut off button to preserve battery life which parents love. Parents shared that they found it the Alphabet Activity Cube to be fun and educational at the same time and that their kids played with it for hours. They also loved the price and found it very reasonable. A lot of parents feel it makes a great First Birthday gift for active children who love exploring and engaging with new things. 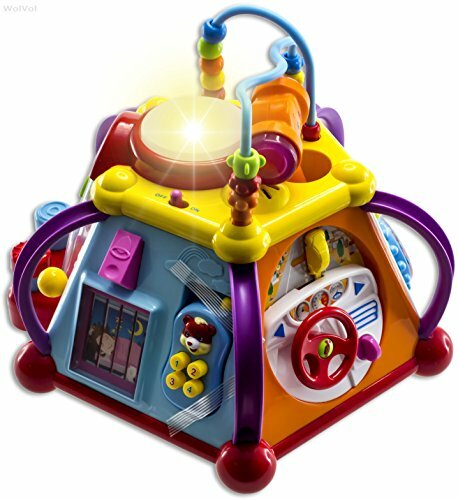 Fun electronic activity cube for one year olds with lots of fun stuff for them to play with! If you are looking for a great way to introduce your 1 year old child to the world of music, this Wolvol Music Activity Cube should fit the bill nicely. 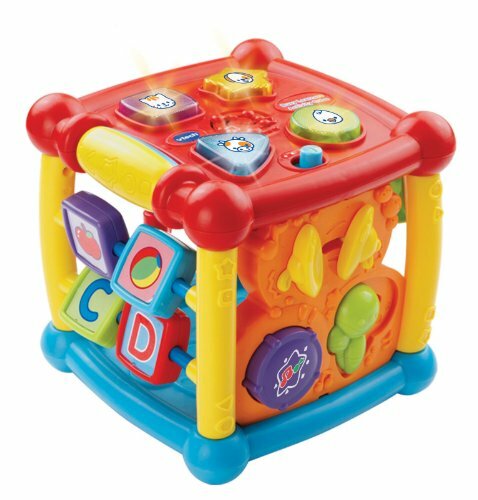 Measuring 11.5” X 11” X 7” this musical cube requires the use of 3AA batteries and has lots of fun activities for your child to enjoy. This brightly colored and eye-catching activity cube includes a small steering wheel with real auto sounds for that toddler who likes to be on the go, a cellphone for those pretend conversations, sliding toys and a bead maze. There is also a microphone that young children just love as it allows them to explore their creative side. When your child turns on the microphone, a cartoon baby-animal with a mic will appear in the mirror! The cellphone is detachable so your little one will enjoy mimicing Mom and Dad on the phone, as well as pretending to call their friends. When your child turns the water tank gears, they will hear music. When they press and ring the bell, a picture will appear below the bell showing a sleeping child waking up! Press the bell again and your little one will see the child eating breakfast, and if they press it a third time, they’ll see the child celebrating their birthday with the Happy Birthday song! Parents shared that their one year olds love the lights, music and moving parts and are captivated by all the bright colors and unique shape. They said it’s a wonderful cube activity center with so much to keep children entertained and engaged for hours, encouraging them to role play and have fun! Eye-catching, colorful, fun and engaging musical cube that children just love!